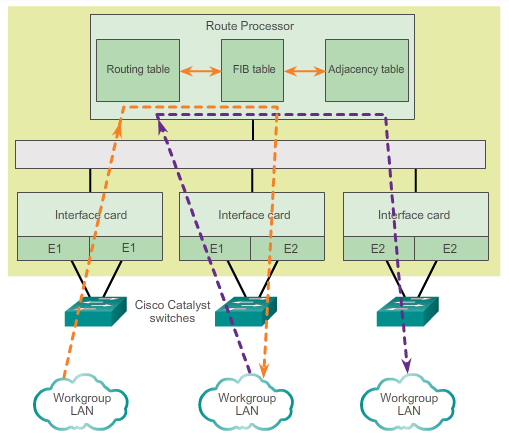 Download "CCNA R&S: Introduction to Networks. 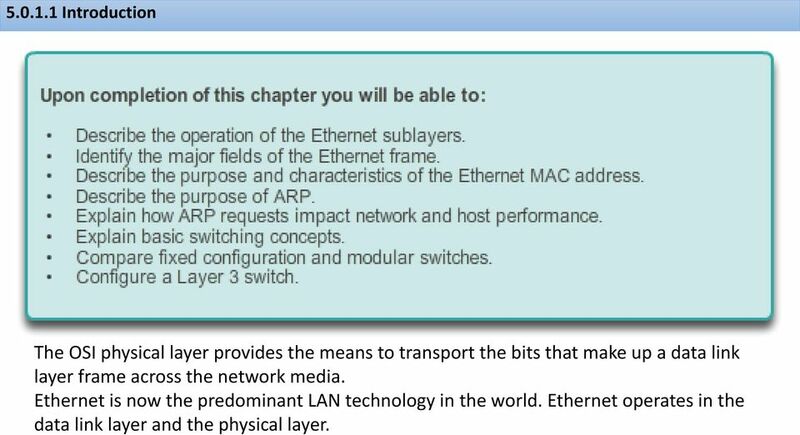 Chapter 5: Ethernet"
2 Introduction The OSI physical layer provides the means to transport the bits that make up a data link layer frame across the network media. 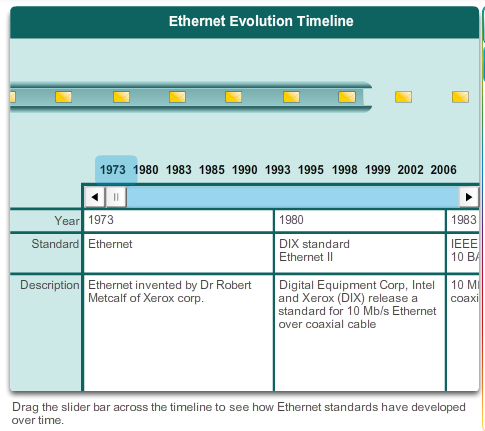 Ethernet is now the predominant LAN technology in the world. 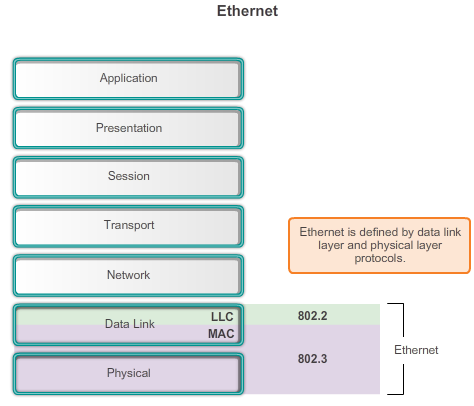 Ethernet operates in the data link layer and the physical layer. 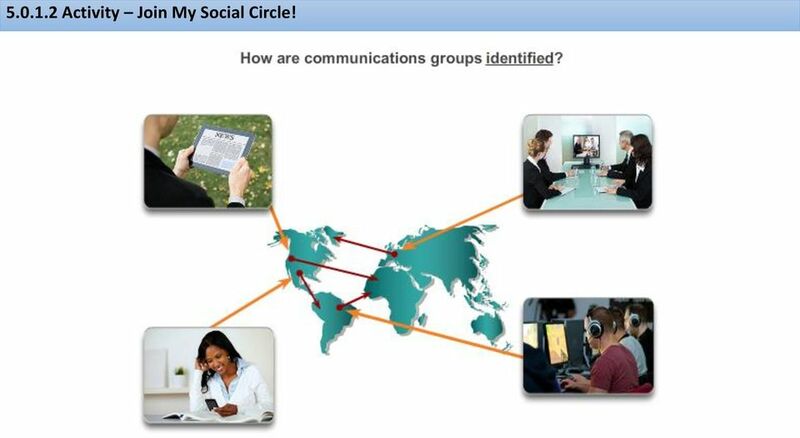 3 Activity Join My Social Circle! 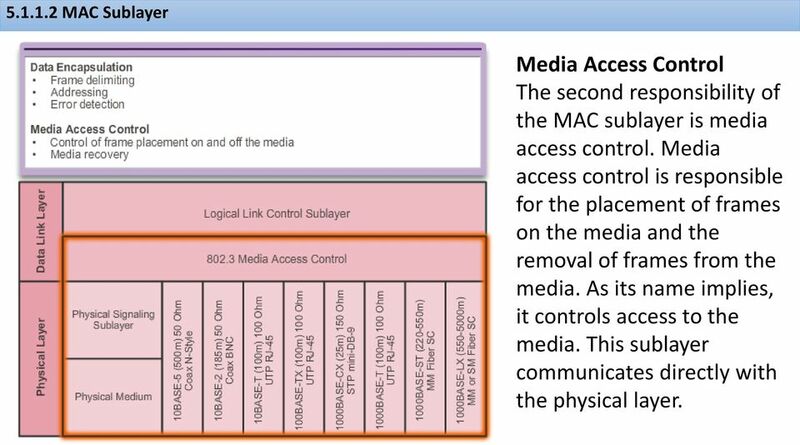 6 MAC Sublayer Media Access Control The second responsibility of the MAC sublayer is media access control. Media access control is responsible for the placement of frames on the media and the removal of frames from the media. As its name implies, it controls access to the media. 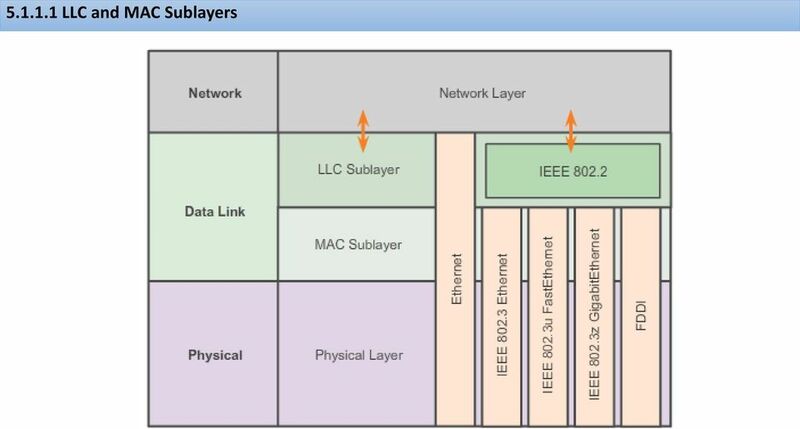 This sublayer communicates directly with the physical layer. 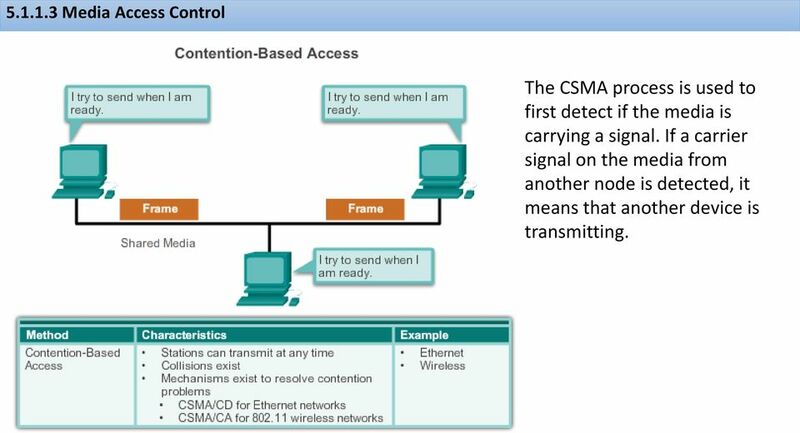 7 Media Access Control The CSMA process is used to first detect if the media is carrying a signal. If a carrier signal on the media from another node is detected, it means that another device is transmitting. 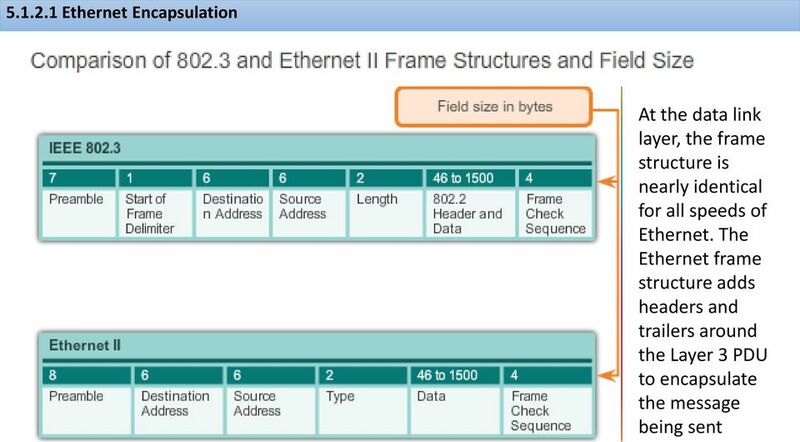 8 MAC Address: Ethernet Identity MAC addressing is added as part of a Layer 2 PDU. 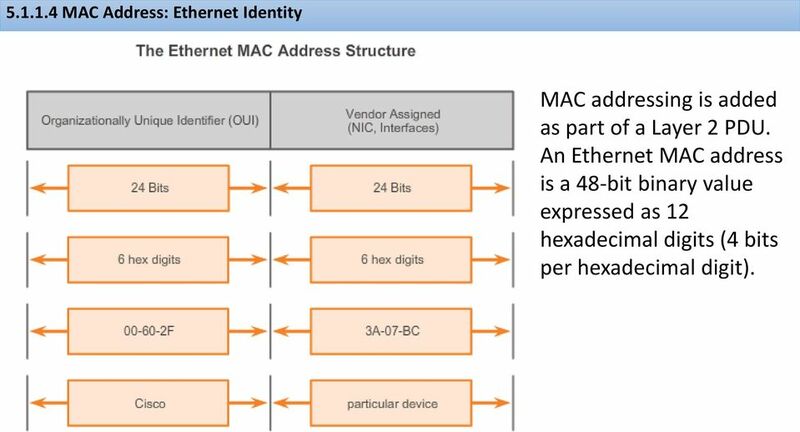 An Ethernet MAC address is a 48-bit binary value expressed as 12 hexadecimal digits (4 bits per hexadecimal digit). 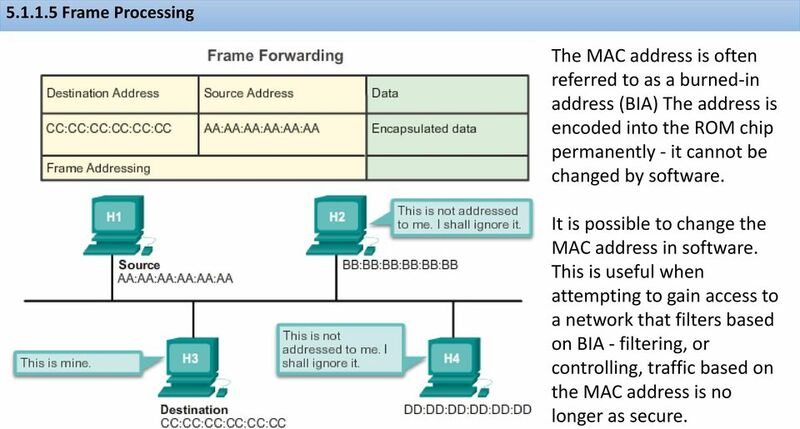 9 Frame Processing The MAC address is often referred to as a burned-in address (BIA) The address is encoded into the ROM chip permanently - it cannot be changed by software. It is possible to change the MAC address in software. This is useful when attempting to gain access to a network that filters based on BIA - filtering, or controlling, traffic based on the MAC address is no longer as secure. 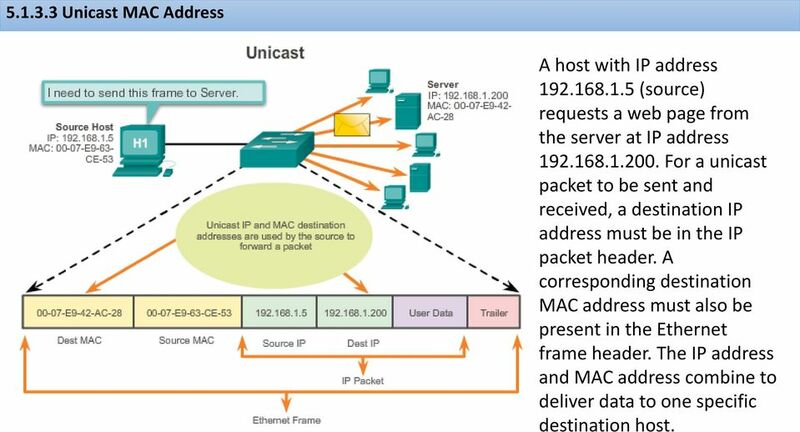 18 Unicast MAC Address A host with IP address (source) requests a web page from the server at IP address For a unicast packet to be sent and received, a destination IP address must be in the IP packet header. 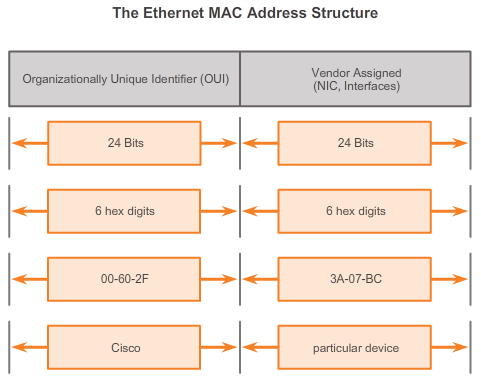 A corresponding destination MAC address must also be present in the Ethernet frame header. The IP address and MAC address combine to deliver data to one specific destination host. 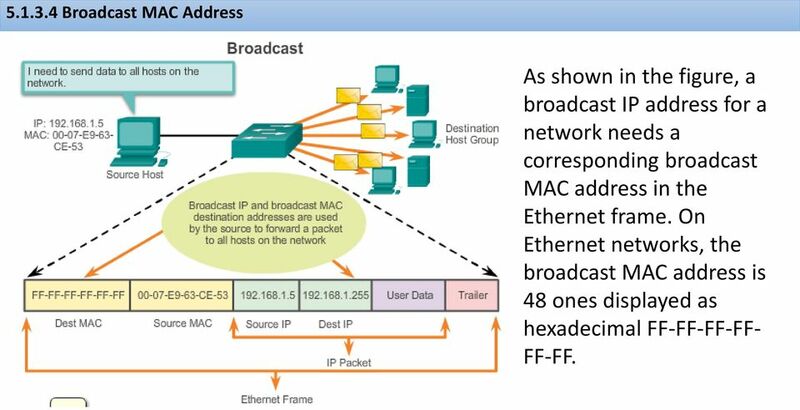 19 Broadcast MAC Address As shown in the figure, a broadcast IP address for a network needs a corresponding broadcast MAC address in the Ethernet frame. 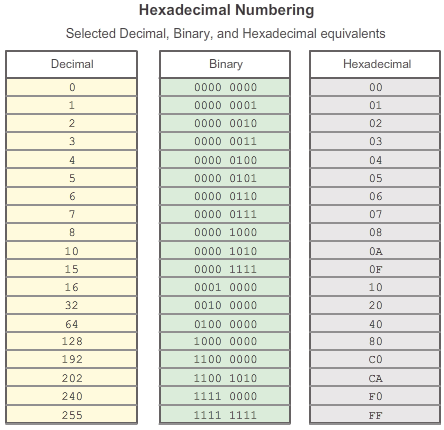 On Ethernet networks, the broadcast MAC address is 48 ones displayed as hexadecimal FF-FF-FF-FF- FF-FF. 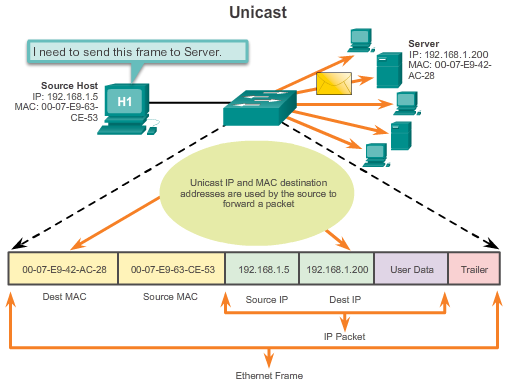 20 Multicast MAC Address As with the unicast and broadcast addresses, the multicast IP address requires a corresponding multicast MAC address to actually deliver frames on a local network. 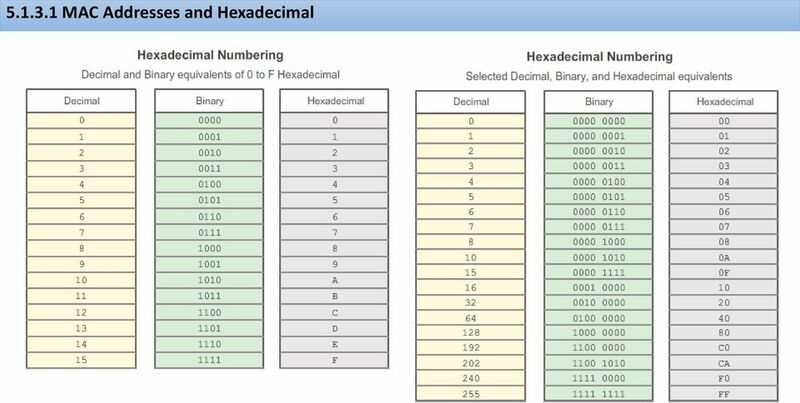 The multicast MAC address is a special value that begins with E in hexadecimal. 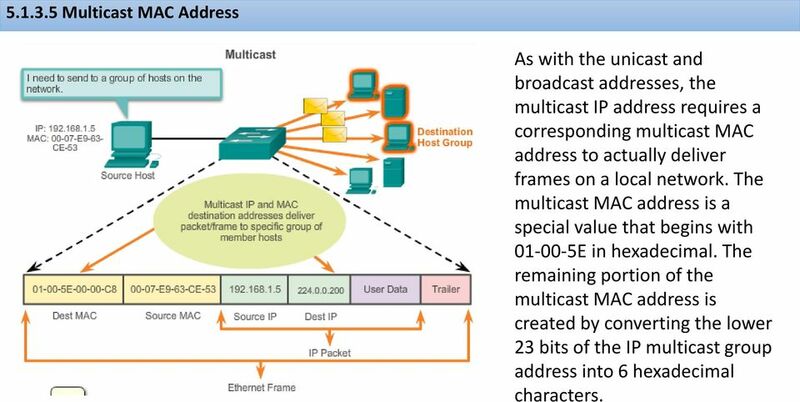 The remaining portion of the multicast MAC address is created by converting the lower 23 bits of the IP multicast group address into 6 hexadecimal characters. 22 MAC and IP Both the physical MAC and logical IP addresses are required for a computer to communicate on a hierarchical network, just like both the name and address of a person are required to send a letter. 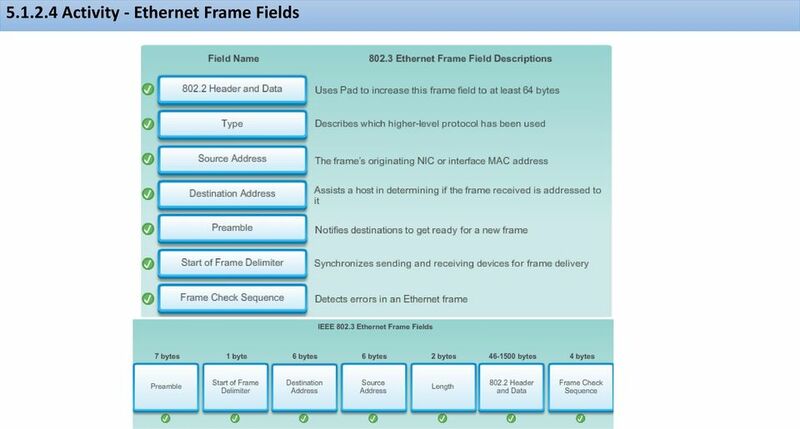 23 End-to-End Connectivity, MAC, and IP End devices on an Ethernet network do not accept and process frames based on IP addresses, rather, a frame is accepted and processed based on MAC addresses. 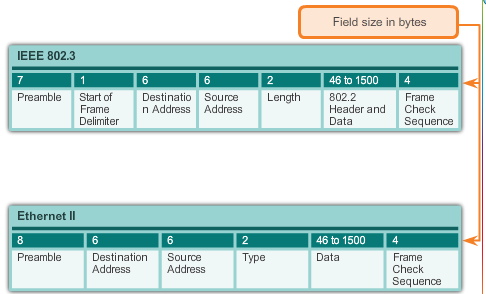 On Ethernet networks, MAC addresses are used to identify, at a lower level, the source and destination hosts. 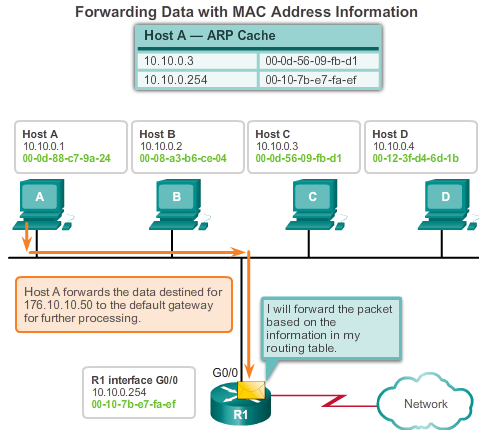 How are the IP addresses of the IP packets in a data flow associated with the MAC addresses on each link along the path to the destination? This is done through a process called Address Resolution Protocol (ARP). 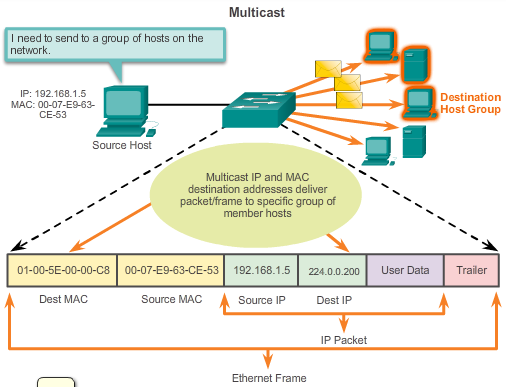 25 Packet Tracer - Identify MAC and IP Addresses This activity is optimized for viewing PDUs. The devices are already configured. You will gather PDU information in simulation mode and answer a series of questions about the data you collect. 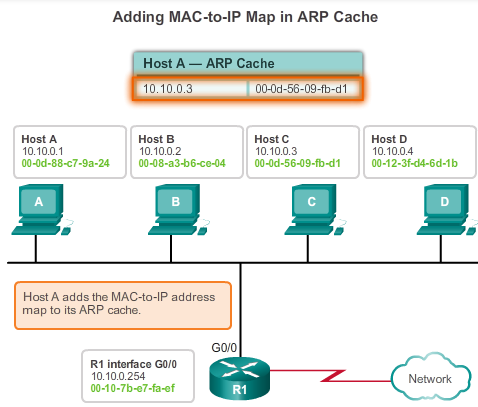 28 ARP Operation When ARP receives a request to map an IPv4 address to a MAC address, it looks for the cached map in its ARP table. If an entry is not found, the Layer 2 processes notify ARP that it needs a map. 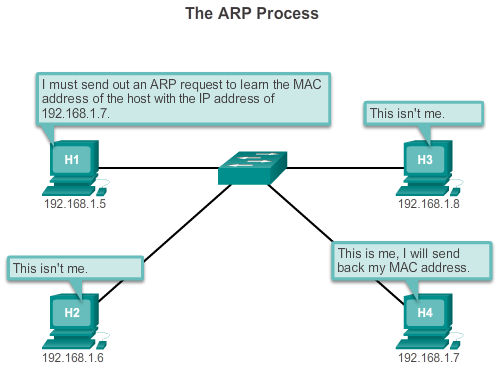 The ARP processes then send out an ARP request packet to discover the MAC address of the destination device on the local network. If a device receiving the request has the destination IP address, it responds with an ARP reply. A map is created in the ARP table. 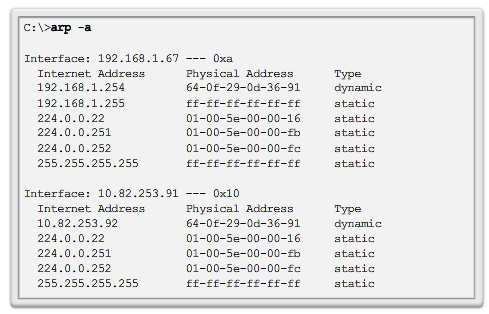 Packets for that IPv4 address can now be encapsulated in frames. 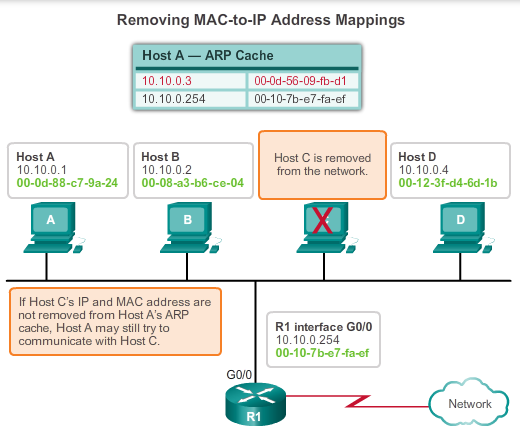 29 ARP Role in Remote Communication If the destination IPv4 host is not on the local network, the source node needs to deliver the frame to the router interface that is the gateway or next hop used to reach that destination. The source node will use the MAC address of the gateway as the destination address for frames containing an IPv4 packet addressed to hosts on other networks. 30 Removing Entries from an ARP Table Commands may also be used to manually remove all or some of the entries in the ARP table. 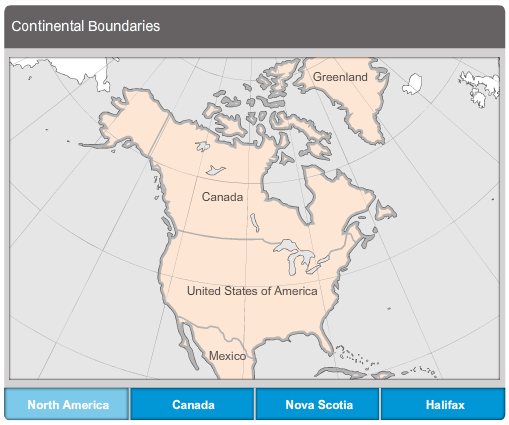 After an entry has been removed, the process for sending an ARP request and receiving an ARP reply must occur again to enter the map in the ARP table. 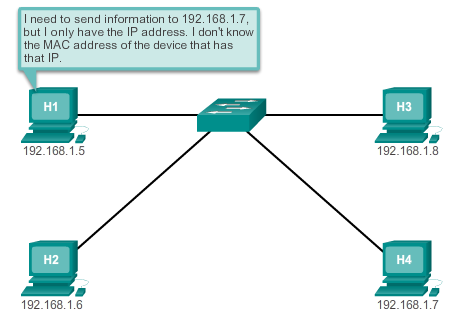 33 Packet Tracer - Examine the ARP Table This activity is optimized for viewing PDUs. The devices are already configured. You will gather PDU information in simulation mode and answer a series of questions about the data you collect. 35 How ARP Can Create Problems In some cases, the use of ARP can lead to a potential security risk. 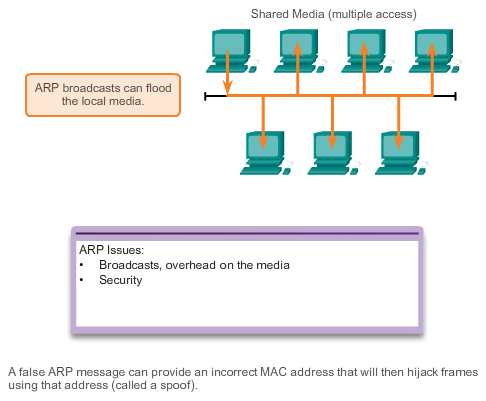 ARP spoofing, or ARP poisoning, is a technique used by an attacker to inject the wrong MAC address association into a network by issuing fake ARP replies. An attacker forges the MAC address of a device and then frames can be sent to the wrong destination. Manually configuring static ARP associations is one way to prevent ARP spoofing. Authorized MAC addresses can be configured on some network devices to restrict network access to only those devices listed. 36 Mitigating ARP Problems Switches provide segmentation of a LAN, dividing the LAN into independent collision domains. Each port on a switch represents a separate collision domain and provides the full media bandwidth to the node or nodes connected on that port. 37 Switch Port Fundamentals A Layer 2 LAN switch performs switching and filtering based only on the OSI data link layer (Layer 2) MAC address. 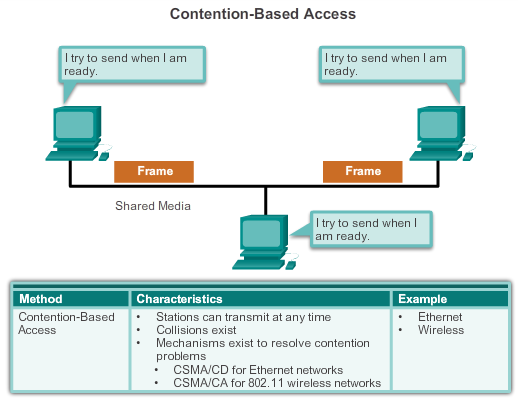 A switch is completely transparent to network protocols and user applications. 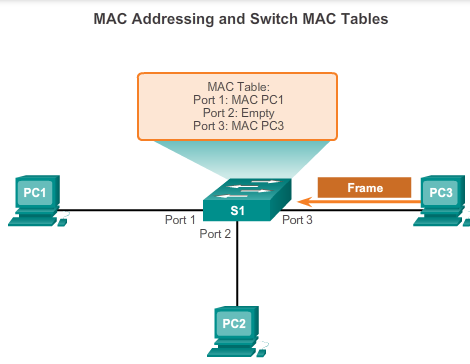 A Layer 2 switch builds a MAC address table that it uses to make forwarding decisions. 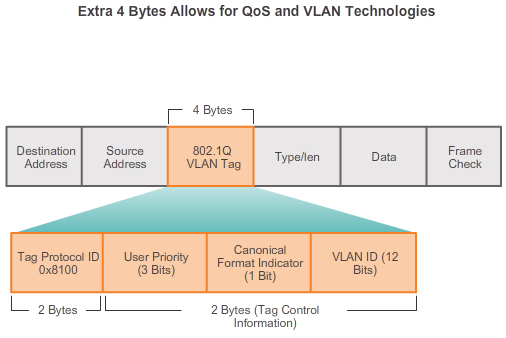 Layer 2 switches depend on routers to pass data between independent IP subnetworks. 38 Switch MAC Address Table Switches use MAC addresses to direct network communications through their switch fabric to the appropriate port toward the destination node. The switch fabric is the integrated circuits and the accompanying machine programming that allows the data paths through the switch to be controlled. For a switch to know which port to use to transmit a unicast frame, it must first learn which nodes exist on each of its ports. 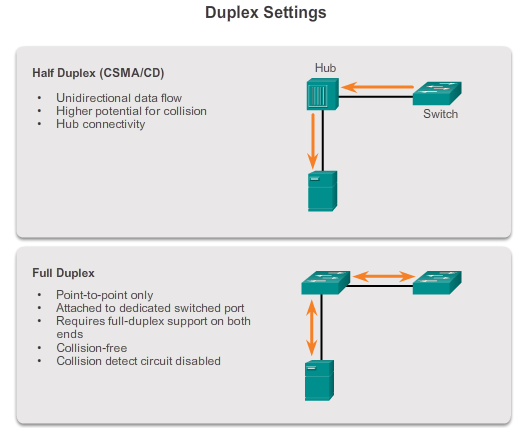 39 Duplex Settings Half-duplex communication relies on unidirectional data flow where sending and receiving data are not performed at the same time. In full-duplex communication, data flow is bidirectional, so data can be sent and received at the same time. The bidirectional support enhances performance by reducing the wait time between transmissions. 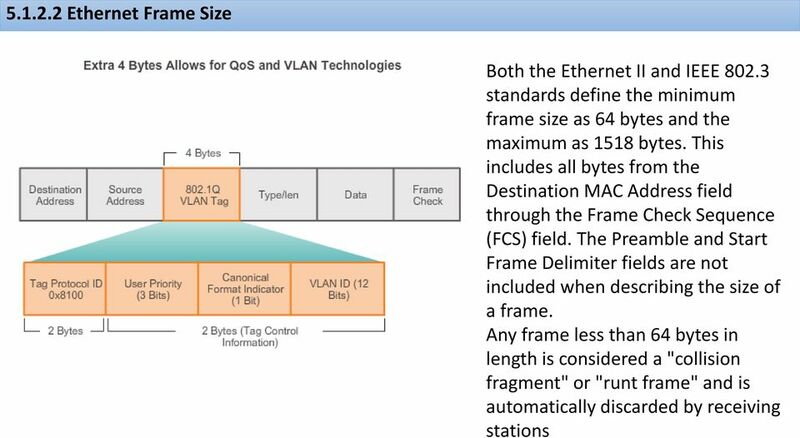 Most Ethernet, Fast Ethernet, and Gigabit Ethernet NICs sold today offer fullduplex capability. In full-duplex mode, the collision detect circuit is disabled. 40 Auto-MDIX Switch detects the required cable type for copper Ethernet connections and configures the interfaces accordingly. Therefore, you can use either a crossover or a straight-through cable for connections to a copper 10/100/1000 port on the switch, regardless of the type of device on the other end of the connection. 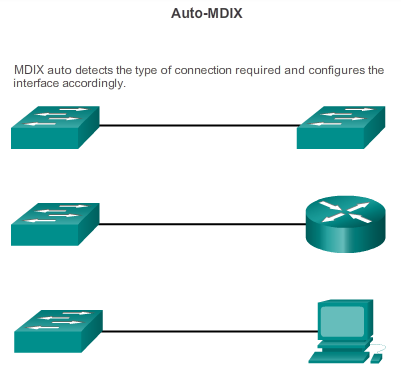 The auto-mdix feature is enabled by default on switches running Cisco IOS Release 12.2(18)SE or later. For releases between Cisco IOS Release 12.1(14)EA1 and 12.2(18)SE, the auto- MDIX feature is disabled by default. 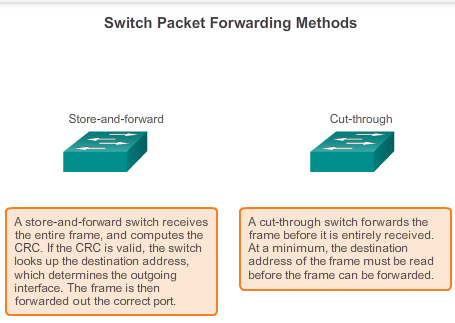 41 Frame Forwarding Methods on Cisco Switches In store-and-forward switching, when the switch receives the frame, it stores the data in buffers until the complete frame has been received. During the storage process, the switch analyzes the frame for information about its destination. In this process, the switch also performs an error check using the Cyclic Redundancy Check (CRC) trailer portion of the Ethernet frame. 44 Cut-Through Switching Fast-forward switching: offers the lowest level of latency. immediately forwards a packet after reading the destination address. there may be times when packets are relayed with errors. This occurs infrequently, and the destination network adapter discards the faulty packet upon receipt. latency is measured from the first bit received to the first bit transmitted. 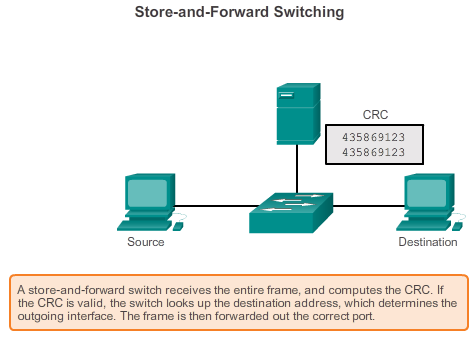 Fragment-free switching: switch stores the first 64 bytes of the frame before forwarding. compromise between store-and-forward switching and fast-forward switching. most network errors and collisions occur during the first 64 bytes. error check on the first 64 bytes of the frame to ensure that a collision has not occurred Fragment-free switching is a compromise between the high latency and high integrity of store-and-forward switching, and the low latency and reduced integrity of fast-forward switching. 46 Memory Buffering on Switches As discussed, a switch analyzes some or all of a packet before it forwards it to the destination host. 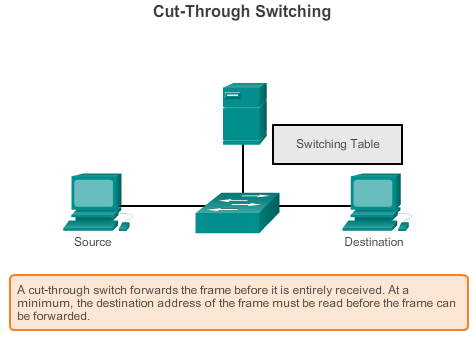 An Ethernet switch may use a buffering technique to store frames before forwarding them. Buffering may also be used when the destination port is busy due to congestion and the switch stores the frame until it can be transmitted. 47 Activity - Switch It! 49 Fixed versus Modular Configuration Fixed configuration switches are fixed in their configuration. What that means is that you cannot add features or options to the switch beyond those that originally came with the switch. The particular model you purchase determines the features and options available. Modular switches offer more flexibility in their configuration. Modular switches typically come with different sized chassis that allow for the installation of different numbers of modular line cards. The line cards actually contain the ports. 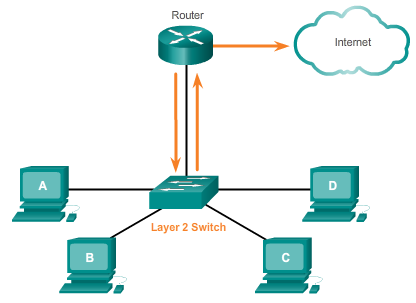 52 Layer 2 versus Layer 3 Switching Layer 2 LAN switch performs switching and filtering based only on the OSI data link layer (Layer 2) MAC address and depends upon routers to pass data between independent IP subnetworks a Layer 3 switch can also learn which IP addresses are associated with its interfaces. This allows the Layer 3 switch to direct traffic throughout the network based on IP address information as well. 54 Types of Layer 3 Interfaces Cisco networking devices support a number of distinct types of Layer 3 interfaces. A Layer 3 interface is one that supports forwarding IP packets toward a final destination based on the IP address. 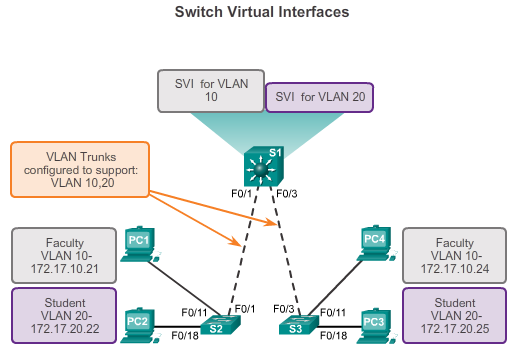 The major types of Layer 3 interfaces are: Switch Virtual Interface (SVI) - Logical interface on a switch associated with a virtual local area network (VLAN). 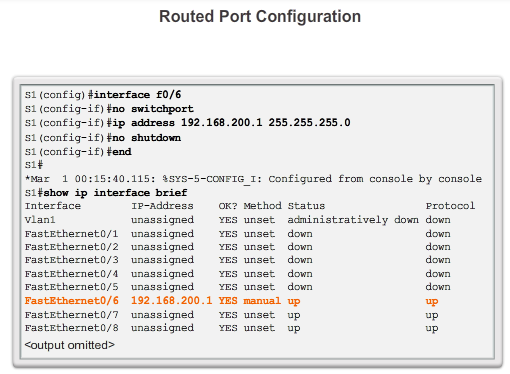 Routed Port - Physical port on a Layer 3 switch configured to act as a router port. 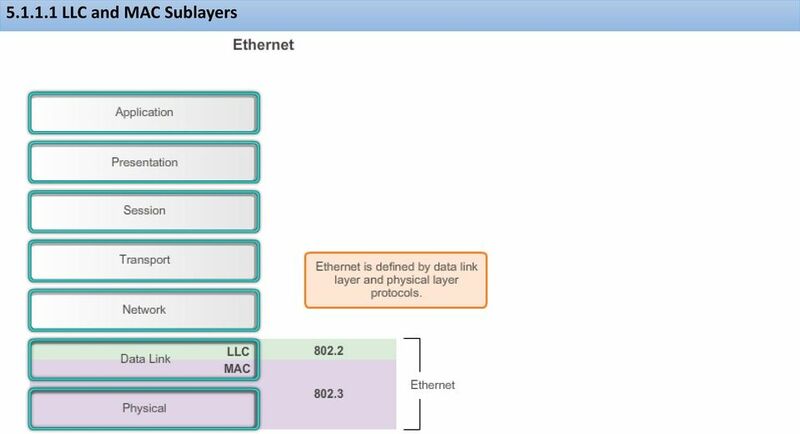 Layer 3 EtherChannel - Logical interface on a Cisco device associated with a bundle of routed ports. 55 Configuring a Routed Port on a Layer 3 Switch A switch port can be configured to be a Layer 3 routed port and behave like a regular router interface. 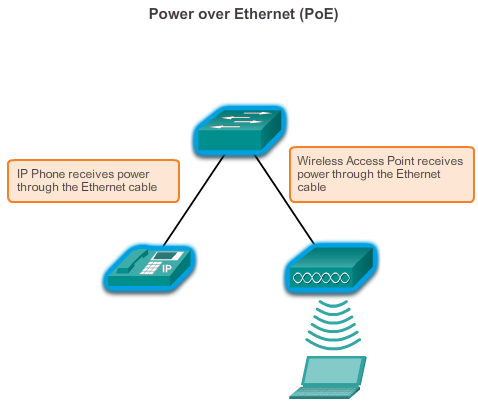 Specifically, a routed port: Is not associated with a particular VLAN. Can be configured with a Layer 3 routing protocol. 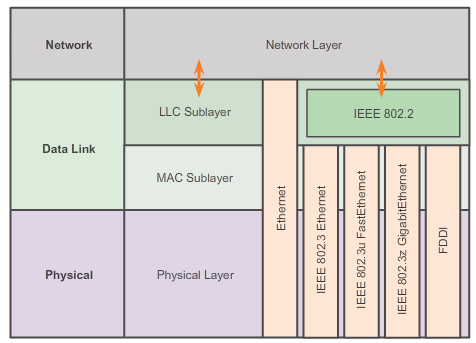 Is a Layer 3 interface only and does not support Layer 2 protocol. Configure routed ports by putting the interface into Layer 3 mode with the no switchport interface configuration command. Then assign an IP address to the port. That's it! 56 Packet Tracer - Configure Layer 3 Switches The Network Administrator is replacing the current router and switch with a new Layer 3 switch. As the Network Technician, it is your job to configure the switch and place it into service. You will be working after hours to minimize disruption to the business. 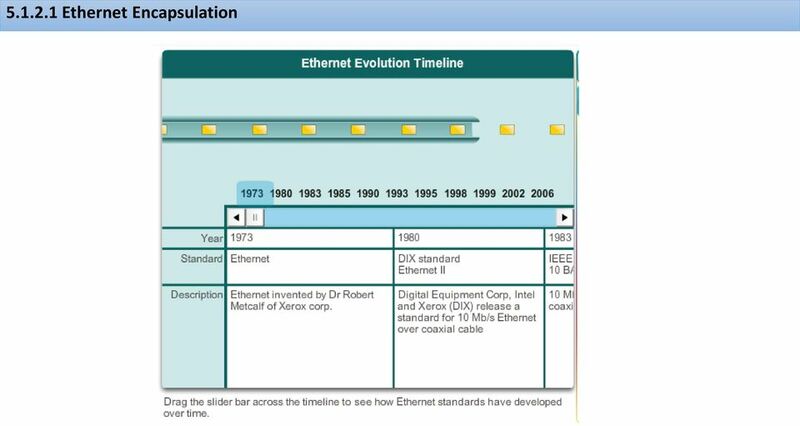 57 Activity - MAC and Choose Please view the video located at the following link: -metcalfe-the-history-of-ethernet Topics discussed include not only where we have come from in Ethernet development, but where we are going with Ethernet technology (a futuristic approach). 59 Thanks Thanks for your attention!! Candidates should attempt FOUR questions. All questions carry 25 marks. IP Addressing and Subnetting. 2002, Cisco Systems, Inc. All rights reserved. 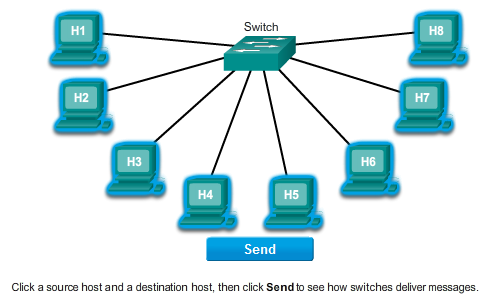 Howstuffworks "How LAN Switches Work" Click here to go back to the normal view! Course Overview: Learn the essential skills needed to set up, configure, support, and troubleshoot your TCP/IP-based network. CHAPTER 21 This chapter describes how to configure the IEEE 802.1ak Multiple VLAN Registration Protocol () and Multiple Registration Protocol (MRP) as implemented in accordance with the IEEE 802.1ak standard. 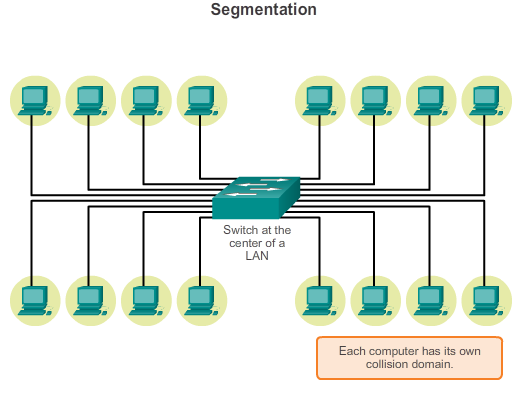 Unit 2: LAN Configurations Lesson 2-3: Ethernet Basics At a Glance Ethernet LAN topology is currently the most common network architecture. Ethernet topologies are generally bus and/or bus-star topologies. Local Area Networks. 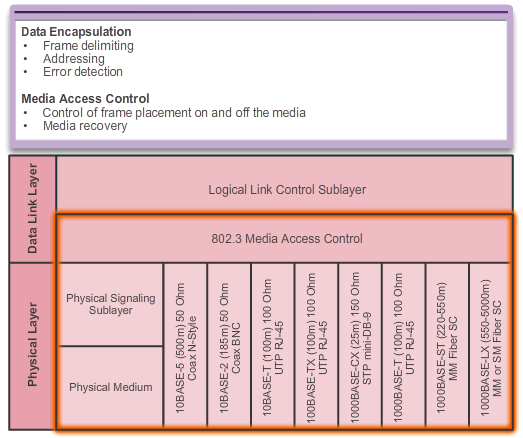 Ethernet 802.3 LAN - 7-1. Topology Objectives Part 1: Prepare Wireshark to Capture Packets Select an appropriate NIC interface to capture packets. Part 2: Capture, Locate, and Examine Packets Capture a web session to www.google.com. CCNA is a well renowned international certification by Cisco Systems in the field of computer networking.